Tech giant Apple (AAPL) has released its highly anticipated quarterly results earlier this week. Analysts as well as investors have weighed in on the company that makes the popular iPhone, and both liked what they see. Apple posted quarterly revenue of $42.4 billion and quarterly net income of $7.8 billion, or $1.42 per diluted share. These results compare to revenue of $49.6 billion and net income of $10.7 billion, or $1.85 per diluted share, in the same quarter last year. Gross margin was 38% compared to 39.7% from last year. International sales accounted for 63% of the quarter’s revenue. “We are pleased to report third quarter results that reflect stronger customer demand and business performance than we anticipated at the start of the quarter,” said Tim Cook, Apple’s CEO. “We had a very successful launch of iPhone SE and we’re thrilled by customers’ and developers’ response to software and services we previewed at WWDC in June.” WWDC is Apple’s Worldwide Developers Conference. The conference is used by Apple to showcase its new software and technologies for software developers. Although iPhone sales in this quarter fell 15% from the same time last year, it still exceeded the average estimate put out by analysts. Shares jumped up 7% in the pre-market following the publication of its quarterly results. After several months of stock decline, AAPL is finally looking to move higher again. Raymond James Financial has upgraded its rating for Apple from “market perform” to “outperform,” with a $129 price target over the next 12 months. This represents a 24% appreciation from AAPL’s current price, $104/share. 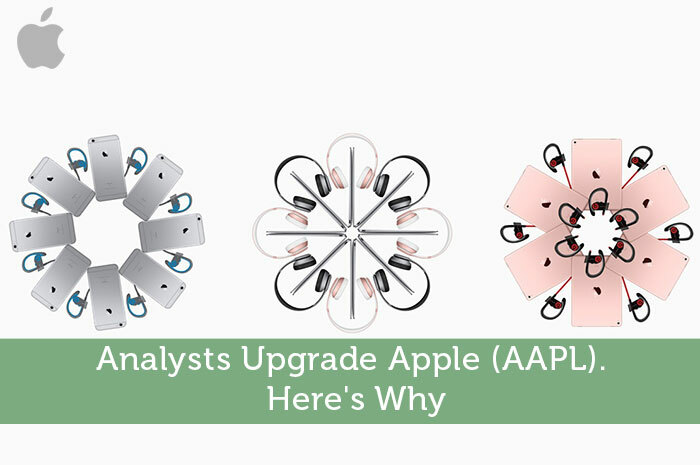 Raymond James’ analyst Tavis McCourt mentions that unlike the previous time that they’ve “upgraded AAPL shares, in front of the iPhone 6 cycle, this upgrade has less to do with a product cycle and the potential for there to be much more muted product cycles in the future as the smartphone industry matures.” RBC Capital Markets’ Amit Daryanani was also pleased with the earnings but maintains a more cautious $115 price target. There are some people on Wall Street that have bearish views on Apple’s future performance. But at this time there are 44 ‘buy’ ratings and only 3 ’sell’ ratings, with the average price target at $122.66. In terms of moving forward, Apple has provided investors with some expected guidance for its fiscal 2016 fourth quarter. This includes projected revenue to be about $46 billion, gross margin between 37.5% and 38%, operating expenses around $6.1 billion, and a tax rate of 25.5%. Apple has struggled over the past couple of quarters. Its shares are pretty much flat year to date even after the recent stock increase. And compared to a year ago the stock is currently down about 16%. But sentiments towards AAPL have been changing. Due to low (and sometimes even negative) interest rates on bonds, investors have been pressured to place their money into higher risk investments such as equities in order to maintain a decent portfolio yield. One part of Apple that investors think still has potential for growth is the services and digital download business. “Our Services business grew 19% year-over-year and App Store revenue was the highest ever, as our installed base continued to grow and transacting customers hit an all-time record,” said Luca Maestri, Apple’s CFO. “We returned over $13 billion to investors through share repurchases and dividends, and we have now completed almost $177 billion of our $250 billion capital return program.” With the arrival of the popular mobile game Pokemon Go, Apple stands to earn even more money from its App Store in the following quarters. For each dollar that is spent to purchase in game items in Pokemon Go, 30 cents would go to the App Store, 60 cents to the developers, and 10 cents to Nintendo. Shares of Nintendo doubled earlier this month when people realized how popular Pokemon Go had become. But Apple shares may stand to gain more. This author is long 21 shares AAPL as of writing this post.